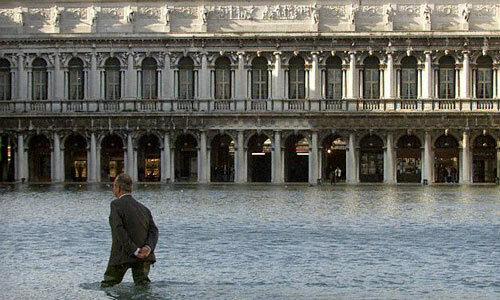 “Italian experts are proposing a dramatic new solution to the watery threat facing the city of Venice,” the BBC reports. Of course, soon they’ll just put the whole city atop a mechanized webwork of spindly little hydraulic legs that will stand up and walk inland – taking the Bridge of Sighs with it. The fully automated Robo-Venice of the future. 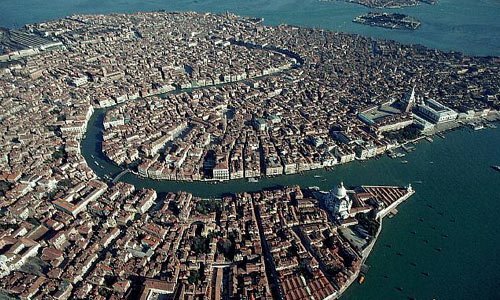 “Venice’s problem is largely one of subsidence, both natural and man-made. From the 1930s to the 1970s, fresh water was pumped out of underground reservoirs beneath the city to supply surrounding factories. As the water was pumped out of these aquifers – which are rather like rocky sponges – their water-filled pores compressed and the ground sank. Combined with sea-level changes, this has produced an effective rise in sea level of 23 centimetres over the past 100 years. Water is no longer being extracted but natural subsidence, probably caused by plate tectonics, is continuing to drag the city down by 0.5 millimetres a year. Add to that the problem of rising sea level and it is clear that Venice’s predicament is getting steadily worse.